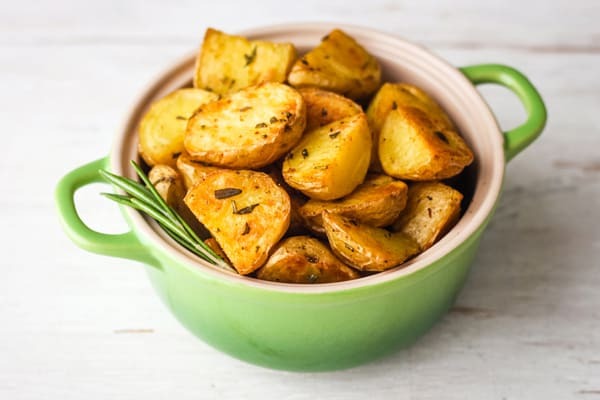 Toaster Oven Rosemary Potatoes are an easy side dish of crispy baby potatoes and fresh rosemary. They’re a tasty addition to any weeknight dinner or your holiday table. Around our house potatoes are less of a special occasion item and more like an everyday event. While the classic toaster oven baked potato is always a favorite, these creamy southwestern twice baked potatoes do make the occasional appearance and roasted sweet potato rounds are a movie night snack staple. 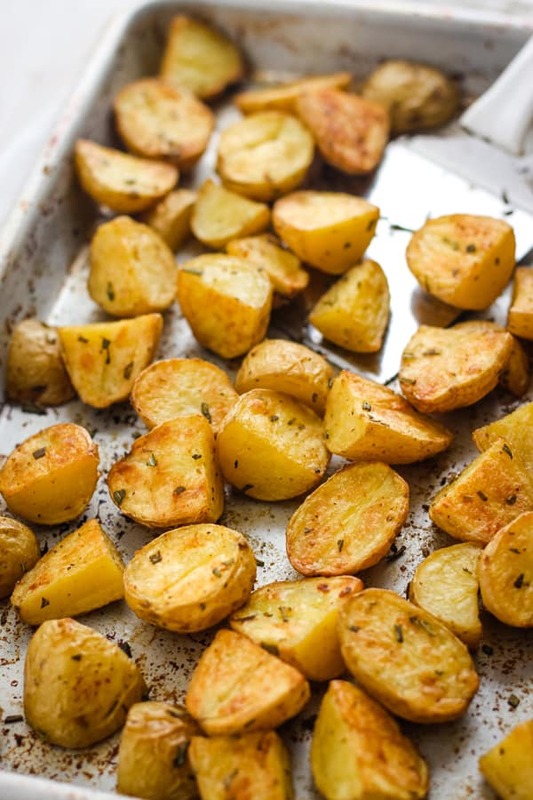 But right now, my go-to dish is this toaster oven rosemary potatoes recipe. There’s something about the simple combination of olive oil, aromatic fresh rosemary, and sweet garlic. 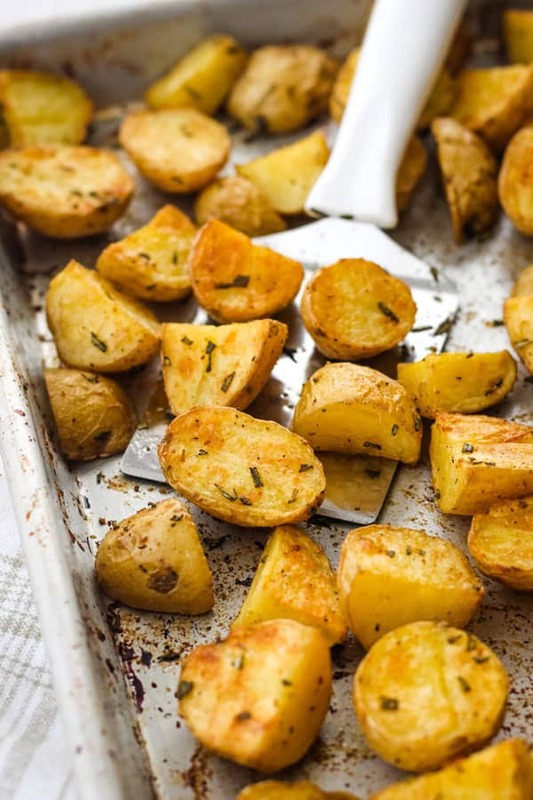 Together they magically make a batch of humble roasted potatoes feel special. Fancy even. While this easy recipe comes together quickly it can take a bit of time to cook. Try to be patient, those golden crispy edges and creamy middle are so worth the wait. One of the reasons I love our Breville Smart Oven Pro is that it can fit a quarter sheet pan. 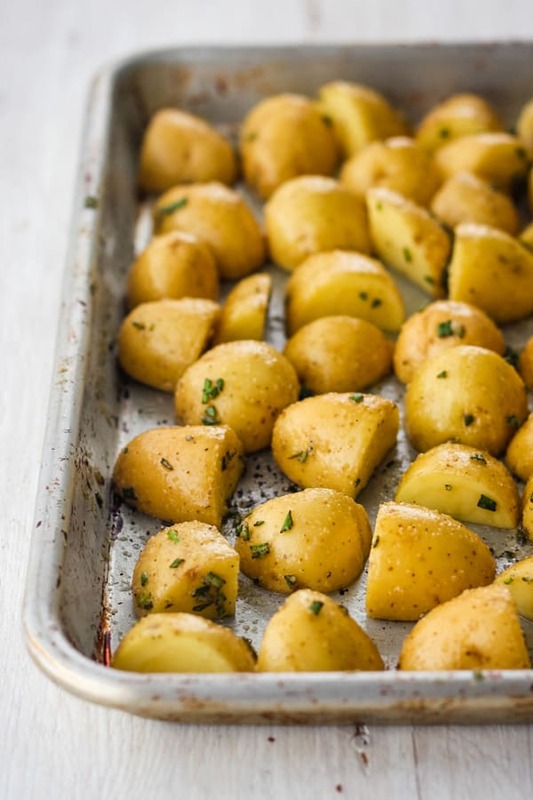 That size pan is great if you’re roasting broccoli, cabbage wedges or a pound of baby potatoes. With a smaller toaster oven, you may need to reduce the ingredient amounts by 1/3 or 1/2 to fit your pan. Don’t stress about exact measurements, this recipe is very forgiving. Usually, when cooking vegetables with our little oven’s convection feature I like to keep the temperature the same and just shorten the cooking time. But at 400°F, the outsides of our potatoes get too crispy before the interiors can cook through. 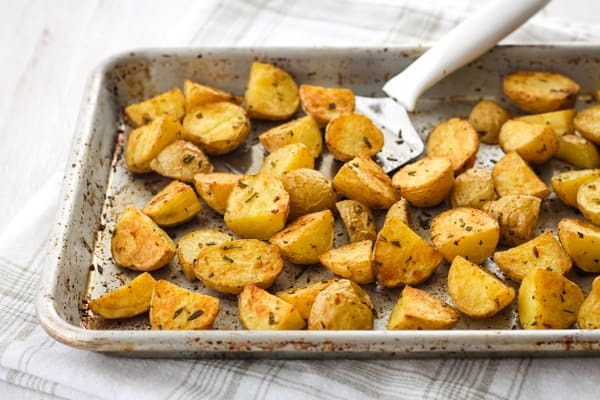 So if you’re cooking these potatoes with a convection toaster oven I’d suggest you reduce the temperature to 375°F and begin checking for doneness after 25 minutes. Try to chop the pieces the same size, around 1/2-inch thick is best. Oil is your friend here. You don’t want them swimming in it but do make sure to oil your pan and coat the potatoes well. 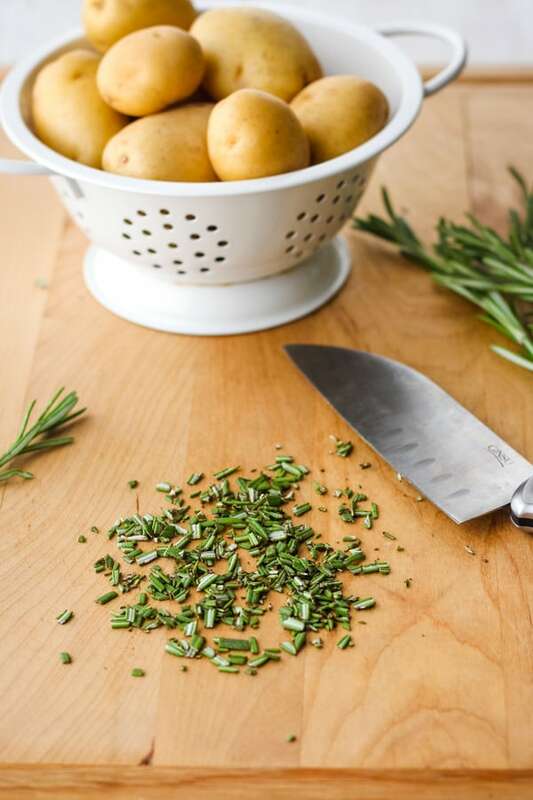 Fresh rosemary smells amazing (like pine needles and nature) but you can substitute 1 teaspoon of dried rosemary instead. It’s not the same but still tasty. Granulated garlic works best because the fresh stuff tends to burn and turn bitter when cooked at a high heat for too long. If you prefer to use fresh minced garlic, I’d wait to add it until halfway through the cooking time. 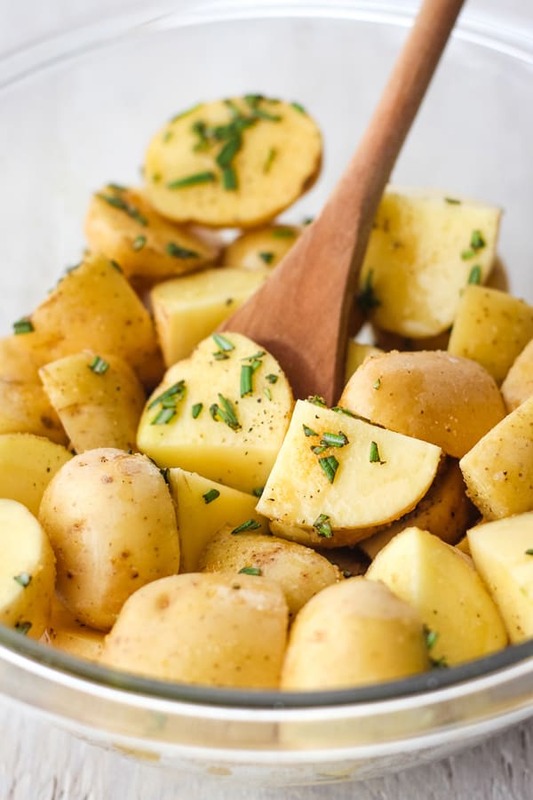 Stirring or flipping the potatoes with a spatula every 10 to 15 minutes will make sure they don’t stick and help to get all the sides golden and crispy. Lastly, while the potatoes are cooling keep an eye out for sneaky pan grazers. The savory aroma always lures them into the kitchen. Before you know it, half the pan has disappeared!